About a week ago the boys actually asked me, when are we going to do another service project? I just can’t describe how that made me feel. Five and six year olds ask to do things that are 1) FUN and 2) IMPORTANT TO THEM. For them to ask this question tells me that they see service as both fun and important to them. So Cole started to brainstorm ideas for things we could do that night. His first one was to go to someone’s house and clean it up for them. I LOVED that idea – how about we start with our own? Just kidding. I explained that we’d have to arrange that with someone because we couldn’t just arrive at our neighbor’s house with a mop and broom. Or could we??? Tina?? Ha! Tyler then asked if we could write a thank you note for our trash man. How sweet! I would have loved to do that, but since I am at work when the trash men come, and they have those metal arm things that lift up the can…I wasn’t sure how to get the note to them. I was beginning to sound like I didn’t want to do a service project. 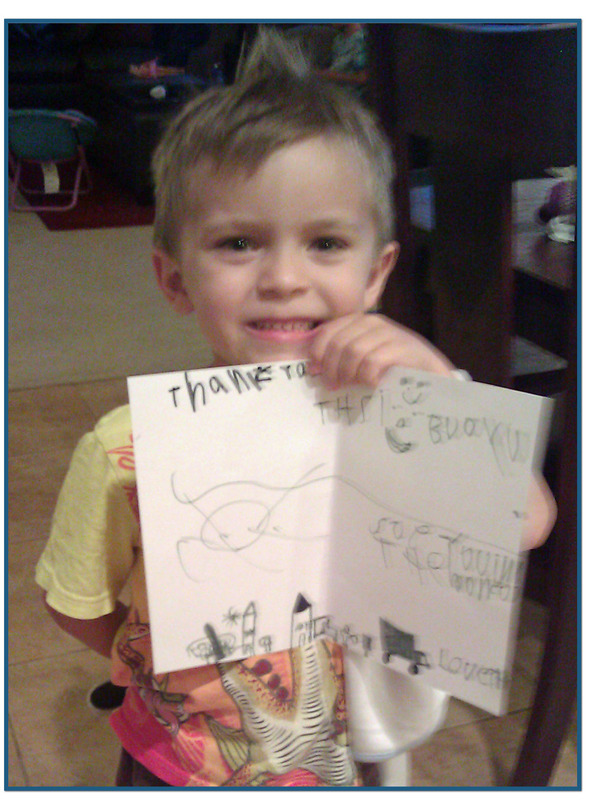 But then Tyler said, let’s make a thank you card for the mailman! AH-HAH! So Tyler and Cole got to work on their cards. Here is a photo of Tyler’s finished card. Our mail”man” is actually a woman, so we thanked our mail carrier. Cole was not pleased with the card that he did, so he asked what else he could do to help. I told him that we could get a gift card too, and he could pick where we get it from. But Cole decided to do better than that he said, HOW ABOUT IF I PAY FOR IT WITH MY MONEY? How sweet is that? My selfless sweet little boy. Of course, I did not let him pay for it, but told him how amazing it was that he wanted to do that. We picked McDonald’s since the mail carrier is always on the go. This week I put Tyler’s card (also signed by Cole), the gift card, and a note from us and left them in our mailbox so the mail carrier would get them. This 52 weeks of service experiment is coming along quite nicely. Enter your email address to subscribe to my email list and receive notifications of news and happenings by email. See what we’ve been up to recently! 52 Weeks of Service · Serving others, alpha to omega.